Every decade there defining moments in music, a style that remains timeless into the future while showing respect to the past - 'Decades With features from Adrian Zammit (guitar), Evan Whetter (keyboards) and Chris Soole (saxophone), davidL's wall of records is transformed into a sample driven soundscape accentuated with Adelaide's best live jazz musicians. Combined with tooBiz's completely honest vocal outlook, 'Decades' is an accurate representation of life in a musical format. dL's Bio I grew up in a house where instead of watching television we would sit around as a family and listen to my dad play records. As a very serious collector he would often take me to record fairs from the age of about 8 years old. You could say an apple never falls far from the tree, except where my father sought out obscure 60's british rock, I seek out good quality music from musicians that played from the heart, be they jazz, soul, reggae, afro, folk or what ever. I started djing locally in the early 90's in clubs, then progressed to entering and placing in various competitions including DMC and ITF. 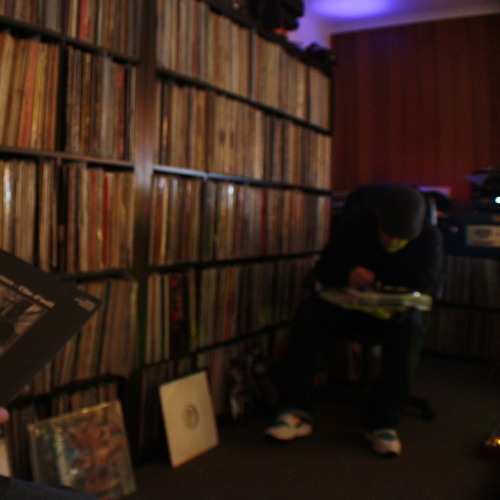 In around 2001 I started taking the whole dj/record collecting thing a little more seriously which saw me djing in many places around Australia and digging for records all over the world. I have shared stages and warmed up with every one from Gangstarr, MOP, Raekwon, Cut Chemist, P.U.T.S, Short Kut, De La Soul, Rob Swift, Mista Sinista, Roc Raida, Rhettmatic, Babu, Dilated Junkies, Dj Krush, Rip One,The Alkaholiks and Lyrics Born through to leading Aussie acts like The Hilltop Hoods,Delta, M-Phazes and Koolism. Since 2002 I have also started making my own music which has included a long standing association with 7 piece jazz fusion band Sukatash, and the up coming Decades release on CH records. Also check my blog for exclusive funk/soul/hip hop edits. Some of the mixes I make are recorded straight from the mixer into a tape deck, some are recorded and multi tracked, some are made to make people dance, some are made to make people think, but all are made for every one who has a genuine love of music to enjoy.